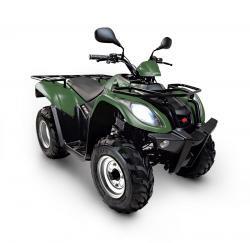 The unique, clean yet aggressive design and functionality features of KYMCO's range of ATV's are just one of the major appeals to their range of on and off-road ATV's. Ideal for work use, KYMCO ATV's are perfect 'work horses' in an agricultural/horticultural/forestry environment, where the powerful 4 stroke water and air cooled engines thrive. 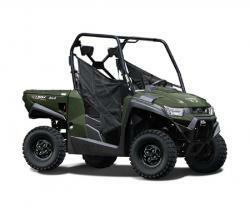 Furthermore KYMCO ATV's will benefit from zero-rated road tax in these environments. Easily manoeuvrable, KYMCO's ATV's are perfect for when you want to shift heavy loads, tackle a mountain or get muddy as their versatility is in the working or leisure environment is unrivalled. Fully automatic with reverse gear as well as adjustable/independent suspension systems and dual purpose tyres are just some of the features that are available on KYMCO ATV's. Want to tackle some of nature's challenging terrain? No problem. Our fully automatic and easy to operate ATV's such as the MXU 500 IRS with its 4WD selector and locking diff, won't give up until you're out of the mud or over that hill. All KYMCO ATV's are road legal and continue the company's mission in reducing carbon emissions by fitting the latest generation engines in all ATV's and bikes. As standard, all KYMCO machines, including our superb quality ATV's all come with a full two-year parts and labour guarantee when in private use and 12 months warranty for commercial use.